Today we returned from a week with family. We did lots of talking. Lots of laughing. We took lots of pictures and ate a lot of food (we took pictures of food). It was just a normal week. Nothing special, but it’s easy sometimes to forget just how special these ordinary days can be. When I looked at this picture, I realized it could have easily been taken twenty years ago. Our family traditions for Thanksgiving food don’t seem to have changed one bit. 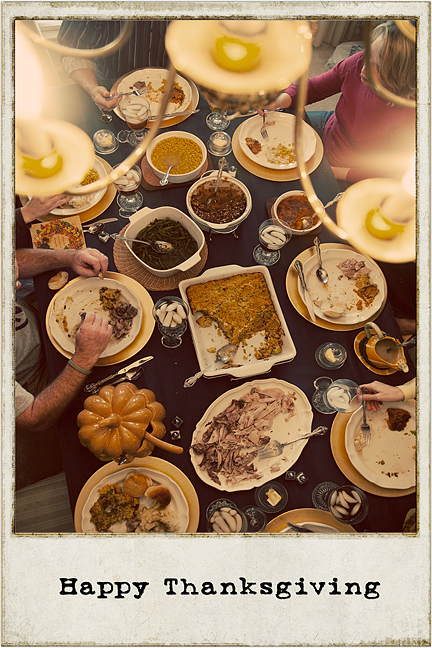 Whether it’s my grandma Margie’s huge pot of homemade noodles, Dave’s grandmother’s cornbread stuffing, my mom’s hundreds of hot rolls, or that steaming bowl of giblet gravy (the one food tradition I don’t think I can stomach passing on to my children), there’s such comfort in the familiar tastes of the holidays. Though our lives may change, I’m thankful for the comfort of this meal, this time, these people.